Today I’ve been busy in my kitchen preparing a New Year’s Eve feast for our little family tonight. But, I did want to take a quick minute to share a fun cocktail to celebrate with tonight! We spend New Year’s Eve at home every year. We used to be big party people, but now in my mind there is nothing better than staying home with my boys, having a few cocktails, and waiting for the ball to drop. 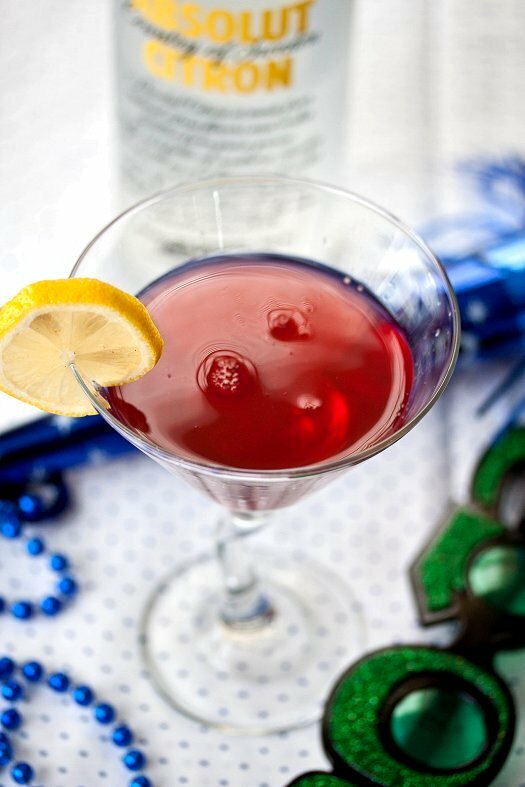 Chances are you have most of what you need in your liquor cabinet already to make these, and they’re perfect for New Year’s Eve. I love the vivid hue, it’s just so festive! I hope that everyone has a happy & safe New Years Eve, full of fun and laughter. Here’s to a fabulous 2013! Combine ice, as well as other ingredients in cocktail shaker. Shake for 30 seconds. Strain into chilled martini glass and garnish with lemon wedge.